Sri City, January 30, 2019:- A 9 member delegation of senior officials of Ministry of Commerce, Thailand Government, headed by Mr. Somdet Susomboon, Inspector-General, Office of the Permanent Secretary of the Commerce Ministry visited Sri City on Wednesday. On their arrival at Business Centre, the delegation was accorded a warm reception by Mr. Ramesh Subramaniam, President, Sri City Foundation. The delegates were given a detailed briefing on the unique features of the integrated business city, its world-class infrastructure and brisk pace of development, existing investor-friendly ecosystem, and specific advantages of setting business in Sri City in including the financial incentives offered by state government . 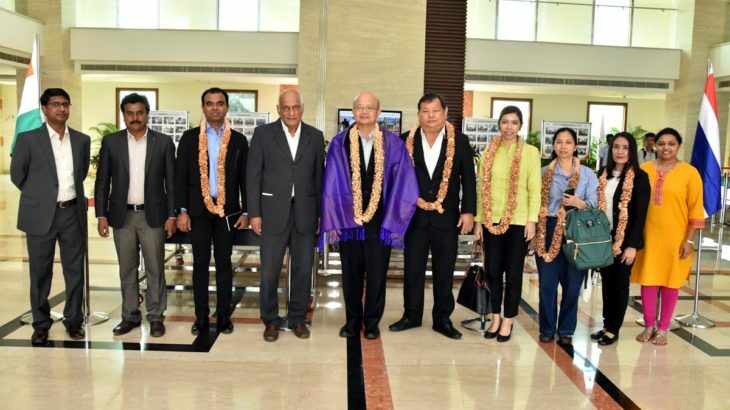 Mr. Somdet Susomboon stated that they all were allured with the world-class infrastructure, business friendly ambiance and the potential business opportunities at Sri City. He expressed confidence that some of the Thai companies would consider Sri City for setting up business, in view of the number of advantages. The delegation included, besides the senior Thai government officers, senior executives from Royal Thai Consulate General in Chennai. The intent of their visit was to acquaint themselves with Sri City’s world-class infrastructure, assess its business potential and explore investment opportunities. During the briefing session, they all evinced keen interest and quizzed on different aspects of Sri City. The team went round the campus and visited the production unit of Rockworth, a Thai furniture company.